Every SaaS company is different, but almost every single one makes a mistake that puts the company in jeopardy. You put your blood, sweat, and tears into building something from nothing, but when it comes to understanding your customer, there isn't a data point to be found. To put this more simply - you don’t understand your pricing strategy. If your company doesn't have a pricing strategy, you don’t understand who your customers are. You have no idea whether you’re driving them away with poorly framed pricing and packaging, or missing the chance to exponentially grow your revenue with higher but more accurate prices. You're leaving huge revenues on the table, which makes you vulnerable to sudden disruptions that can sink your business. Let's walk through why an effective pricing process is one of the most efficient levers of growth to maximize value from each customer, and how you can get started properly attacking your pricing strategy internally. Also, here's the 140 page Pricing Strategy optimization book we wrote that I reference in the video above. When companies think growth, they think customer acquisition. Yet, pricing is the crucial part of your business that has the highest impact on growth. 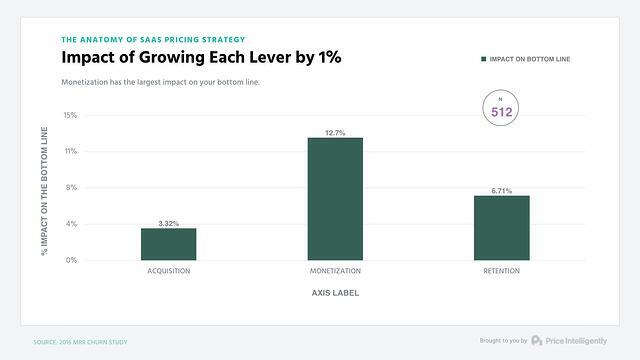 We studied 10,342 blog posts across hundreds of SaaS companies and found that pricing is the most-often overlooked way to drive growth. People in SaaS are writing and thinking about customer acquisition seven times as often as monetization. Growth is more revenue, not more customers. How you monetize those customers is vital. 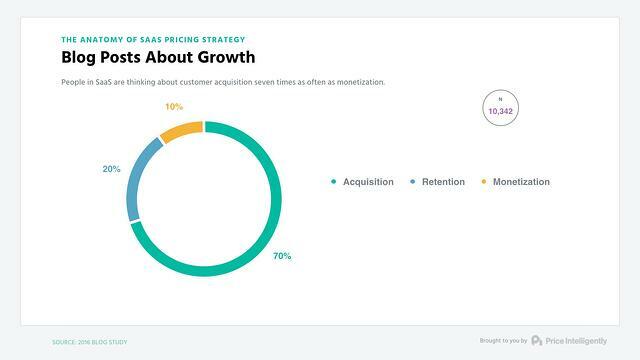 Yet, out of every 10 blog posts on growth, 7 are focused on acquisition, 2 are centered around retention, and only 1 is about pricing. Ironically, the frequency with which people write about each growth lever is inversely related to its effectiveness in driving growth. People write about acquisition, retention, and monetization in that order, but monetization has the biggest impact on the bottom line, followed by retention and then acquisition. In our study of 512 SaaS companies, we found that monetization had the largest impact by far on your bottom line. 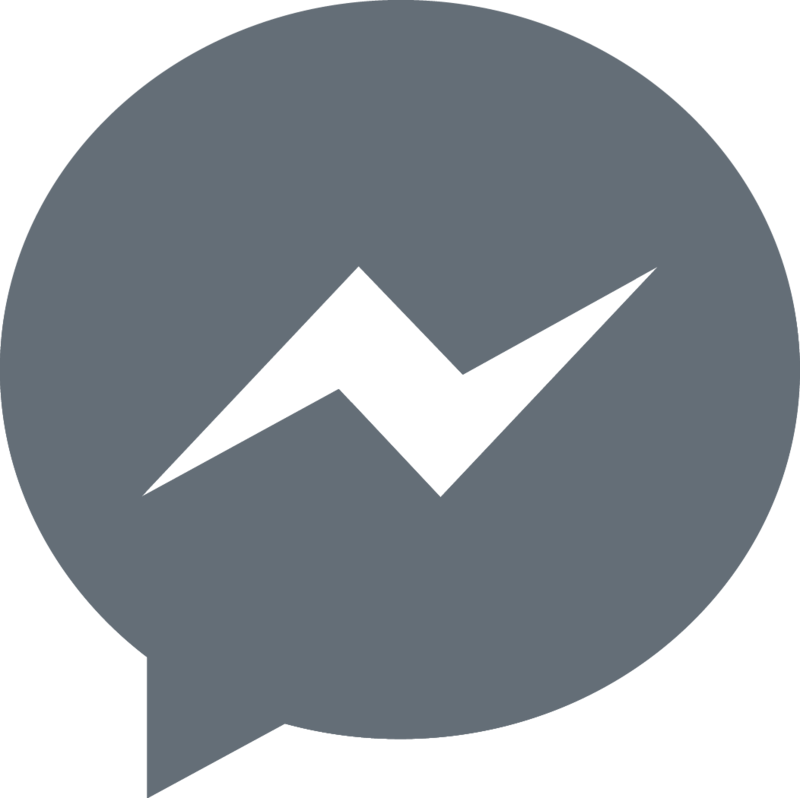 This could mean targeting better customer channels, or raising prices to better fit value. Data shows that pricing is 4x as efficient in improving revenue as acquisition, 2x as efficient as improving retention. By concentrating on pricing, and looking for all possible improvements, you have the chance to use this most effective lever to maximize your profits. When you don’t optimize your pricing, you’re throwing off the math that powers the fundamental economics of your business. On the other hand, pricing is such a great growth opportunity because optimizing pricing makes a company incredibly more efficient. 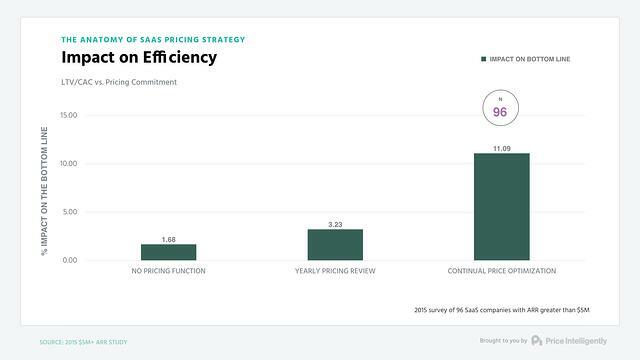 In our survey of 96 SaaS companies with annual recurring revenue (ARR) greater than $5 million, the companies that adjust their prices continually exhibited extremely robust unit economics. 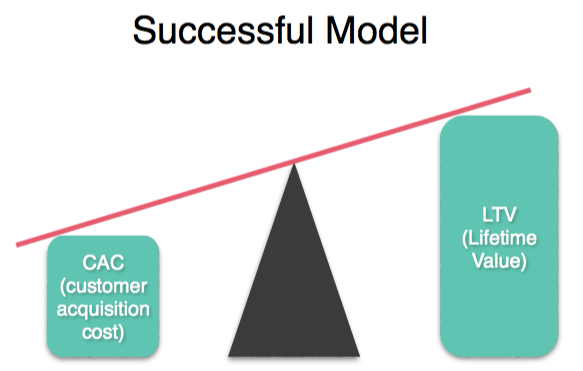 In order to understand whether your unit economics add up to a profitable business model, you need to look at the ratio between two numbers: lifetime value per customer (LTV) and customer acquisition costs (CAC). The ratio between these two has to be greater 1—otherwise, you’re losing money on each and every new customer. Companies who at least had a yearly review had a solid foundation for growth. But companies that made price optimization a continual focus realized far more lifetime value from their customers than it cost to acquire them. With continual price optimization the LTV/CAC ratio skyrockets and CAC is paid back almost immediately. Profitability occurs in the second month, and the growth trajectory shoots up from there. Almost immediately, a company in this scenario would be able to finance more growth (and more efficient growth). Rather than throwing money at customer acquisition, iterations to pricing can produce huge revenue gains that means the difference between a failing company and exponential growth. It’s counterintuitive, but because pricing touches on every single part of your business, it’s often ignored. That’s because it’s at the intersection of marketing, sales, and product—so nobody in the organization owns it. The problem that creates is that all of your marketing, sales, and product have to be developed with the eventual positioning, packaging, and pricing of your product in mind. These three aspects are inextricably linked. If we look at an ideal pricing page, such as Wistia’s, we can see how each of these come together to demonstrate the company’s core value to each buyer persona. Positioning: Aligning your product to attract the right customers. This is along the horizontal axis. Wistia is positioning itself to attract a wide range of possible customers, from small one-person shops all the way to big enterprises, and segments them by buyer persona. Packaging: Having the right feature mix in your plans. Videos are the value metric for Wistia and how it separates different packaging options. This allows companies to start small, but grow over time. Pricing: Finding the right price points that represent value and customers are willing to pay. The pricing on the page reflects the value metric (the number of videos included in the plan). Wistia offers a free tier to convert interested customers, but then the pricing follows a logical pattern of more videos = more cost. You can also see a logical transition for users from one plan to the next. Starting out on the small plan and moving progressively up in scale. Changing one changes the others, and your pricing strategy is a delicate balance of all three, one that it is imperative that you get right. Keeping the Premium plan open-ended leaves room for any customer too big for the standard pricing. Fundamentally, this is why your pricing page is the most important page on your entire site. Every other page on your site funnels to this page, which ties it all together—positioning, packaging, and pricing—and sets the prospect up to buy. Determining each of these and the correct pricing strategy doesn’t happen by accident. To do it right, you need to get input from all members of your team. Because pricing touches on all parts of your business, all parts of your business have to touch on pricing. 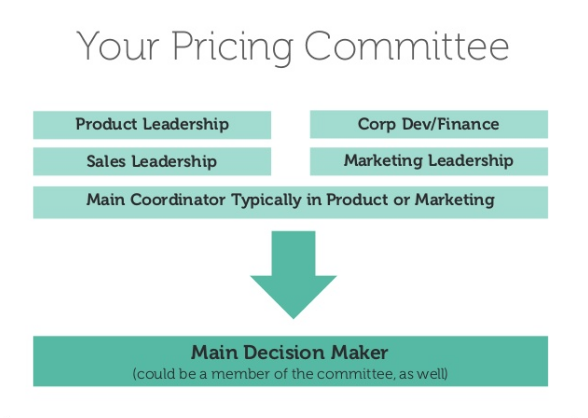 To get pricing right, you need input from every group in your company. Marketing. The marketing department understands the buyer personas you are targeting, so they should be particularly involved with positioning. In turn, this helps them identify the messaging that resonates with the target market, and communicate any pricing changes. Sales. Your pricing needs to convert customers and close sales. The sales team can help you walk through common questions and objections. Being familiar with your pricing helps them develop better pitches and more accurate sales forecasts, which deeply impact your revenue and final profits. Product. Your product developers are the people that build the features based on their deep knowledge of what users need. This contributes to the packaging of your product. Management. It should be the job of the executives at the company, from the CEO down, to coordinate the pricing strategy, bringing in knowledge and information from each of these departments to arrive at a pricing decision. Here, each of the departments can own one of the three aspects of pricing. As you grow and take on Finance and Ops roles within your company, these also need to be included to make sure that the pricing strategy is optimized for profit and growth. One of these departmental leaders should act as coordinator. In particular, marketing is constantly aware of the coordinated efforts of product, sales, and marketing to attract just the right customers, so they are going to be the most absorbed in this process. Finally, the main decision maker should be the CEO. She should be working in tandem with the coordinator to continually optimize pricing, as is needed for exceptional growth. You need all of these people involved because your company exists to make money. It is fundamental that everyone understands this and is invested in getting the most value to the customer, but also the most value to the company. Pricing is vital to the unit economics that underpin a company and support its growth. And because of the way pricing feeds back into and invigorates every department, you’ll build and sell better, and that’s a huge competitive advantage. Pricing optimizes for growth and is so intrinsic to your business because of its ability to drastically improve the foundational numbers of your business: your unit economics. Increasing your customer lifetime value (LTV) and decreasing your customer acquisition costs (CAC) are fundamental to achieving high growth as a business, and the ratio of these, LTV/CAC, is the math your entire business is based upon. CAC is the cost of your sales and marketing efforts to acquire a new customer. Your CAC is the sum of your marketing and sales spending across all channels divided by the number of new customers acquired. You can see how CAC is affected by an efficient pricing strategy. An optimized pricing strategy leads to an optimized funnel. If you position, package and price effectively, then a significant part of your sales and marketing job is already done. Without this pricing strategy it’s more expensive to acquire customers as you will be attracting the wrong prospects that don’t fit with your value. LTV is how much you will earn from each customer over the time they spend with your product. At a basic level, that means dividing your monthly average revenue per user (ARPU) by the rate of customer churn for that same time. Dividing your ARPU by the rate of churn gives you their lifetime value. With good pricing you can both raise ARPU and reduce churn. Raising ARPU comes through upselling and cross-selling customers as they scale up with your value metric. Reducing churn comes from giving customers true value, which they will get if the positioning is precise. Achieving an LTV/CAC ratio of >1 is good, but not enough. You need a substantially higher LTV than CAC, because otherwise you’re not going to grow. Based on the experiences of successful (and unsuccessful) SaaS companies, you need an LTV/CAC ratio of at least 3:1 to run a successful business. But with continual pricing optimization you can push that ratio to 11:1 and beyond. This is because with effective pricing you can reduce your CAC through better positioning and packaging targeting ideal customers, and increase LTV through higher prices and better retention. This leads to increased growth and increased revenues. Here is how StatusPage, the service status communication platform, optimized pricing and improved their unit economics and growth altogether. Initial: They had only positioned for two customer types. Startups/individuals with zero cash, and startups who could afford $600 per year. Optimized: One group was willing to pay more than $0 but less than $50/month for only a couple of extra features not on the free plan, and a second group that was willing to pay far more than $50/month for added functionality. 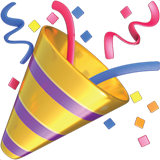 Initial: With only two tiers, either customers got only a bare bones service, or they got everything. Optimized: There was room for a finer gradation of services, both along their value metric (subscribers) and added functionality. Optimized: Customers were actually willing to pay more for the core product and extras. Their second iteration of pricing looked drastically different. Gone was the free plan, as it was evident that the majority of customers were willing to pay, and they went from two plans to four, allowing for significant differentiation in packaging for different buyer personas. When they optimized their prices to reflect the true value they provided to customers it was a fundamental step in increasing ARPU and reducing churn. That’s how they increased their LTV by a whopping 2.4x. They have gone on to optimize prices further, increasing ARPU and multiplying their LTV/CAC ratio as the foundation for massive growth. Over two years, they went from nothing to just short of $2.5 million in ARR. 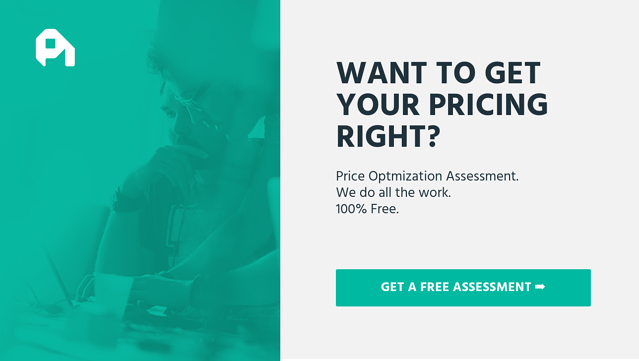 Conclusion: Get your pricing strategy in check. 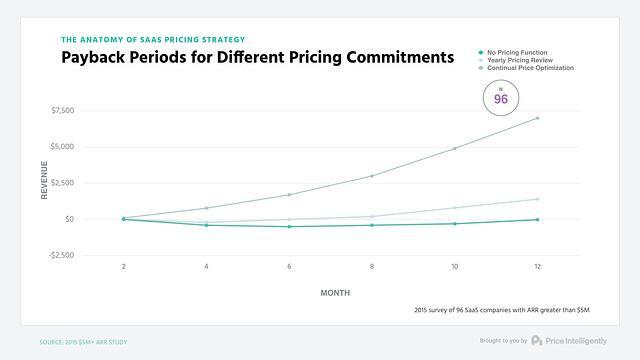 The average SaaS company spends 12.5 hours over their whole lifecycle on pricing. Esentially, only one sort of long work day goes into thinking about whether or not they’re actually valuing your product as much as their customers are. That puts the average company in a position where even as they grow, they’re doing so on unsteady foundations. The best companies, however, are the ones that are making those improvements to their pricing strategy that optimal for growth. They are monetizing their product efficiently, constantly iterating on their positioning, packaging, and pricing, and optimizing for the underlying unit economics. By constantly optimizing and aligning your pricing with what your customers want, you can hit those high LTV/CAC ratios while offering those customers the best possible value you can give. In the rest of this guide, we are going to take you in-depth into how you can monetize your SaaS effectively, build a concrete pricing strategy, and offer more value to better customers. All this will lead to exactly the type of gains here, with great unit economics leading to huge growth gains.